It looks like the Renegade craft show has just posted the artist list for Brooklyn. I'm burning with jealousy! I am still on the waitlist, but applying for this show actually helped me to see all of the places where I needed to improve my application, all the important details I left out and the photos I'll need to take. It was the first big show I've applied for this year so it's a good time to know this stuff. All in all, even though I'm languishing on the wait-list, I still think this is going to be an amazing year for me. What your favourite scene from Alice says about you? This is nice, HGTV's Design blogger mentioned one of my (favourite) Alice pendants in their homage to Alice in Wonderland inspired design. 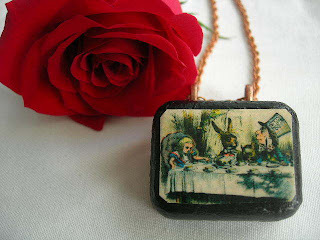 In fact I have two Alice in Wonderland music box pendants in the shop at the moment; both Tenniel illustrations of my two favourite moments. The Mad Hatter's Tea Party is one of them (as if you couldn't guess) and the other is little tiny Alice in the forest, asking advice from big, surly, hookah-smoking talking caterpiller. How much you can tell about a person from her favourite scene in Alice in Wonderland (and Through the Looking Glass)? Are people who like the Cheshire Cat scene a little bit secretive? If the Queen of Hearts losing her cool on the croquet lawn does it for you, is it possible that you're exceptionally well-suited for a job in Naomi Campbell's entourage? Or does the scene of Alice surrounded by tumbling cards hit particularly close to home (I think it does a lot of us). So, I'm curious to test it ha ha, what's your very favourite scene?